Winery Khareba owns an unique and rare wine cellar located in Kvareli, in the Alazani Valley. 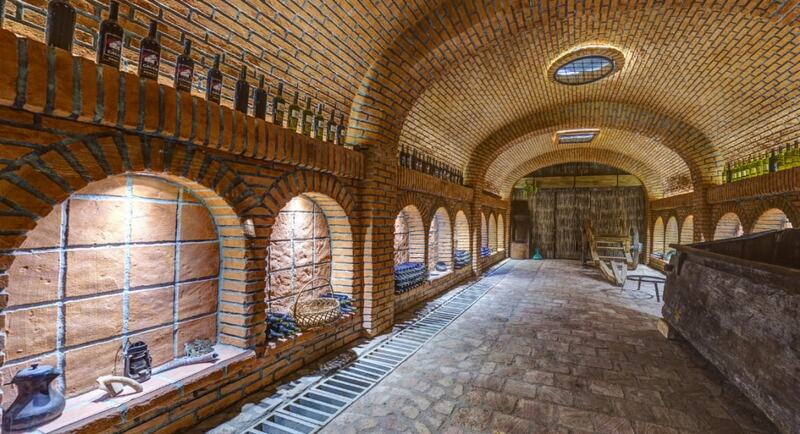 Carved inside the Caucasus mountains and opened in 1962 for the OIV World Congress, the cellar/tunnel is 7.7 kilometers long and preserves a natural temperature of 12-14° Celcius with a humidity rate of 70%; the ideal conditions for wine preservation. The tunnel consists of two main and 13 interconnecting 500 meter tunnels. Visitors can see more than 25,000 bottles of Winery Khareba premium wines aging there and buy some of them in the shop. As well as the storage/tourist tunnel, Winery Khareba offers a large recreational park with river and old Qvevris, a beautiful old georgian-style water mill, a traditional Georgian bread bakery (clay oven), Chacha distillation, a traditional press called “Satsnakheli”, a trout-filled lake, lodges (small traditional houses) and a very large and typical stone fire grill. Guests can taste more than 40 kinds of Winery Khareba wines, bake their own bread, participate in the Chacha making process, prepare "Churchkhela", cook meat on a fire, and, at the right time of year, help harvest the grapes and crush some by foot! If all that has given you an appetite, check out their premium class restaurant 'Saperavi,' also located within the mountain and connected to the tunnel by elevator. The restaurant can accommodate 300 guests and offers the best Georgian cuisine. The restaurant harmoniously connects with nature, with a waterfall, a beautiful garden, a mountain river, tower and veranda, from where pictures can be taken of the open view on the Alazani Valley and Kvareli vineyards. Overall, a brilliant day out for those wishing to discover more about Georgian wine or just to while away a day in beautiful Kakheti nature.